My husband and I have been hearing the hype about Harry Potter and the Cursed Child since last summer. 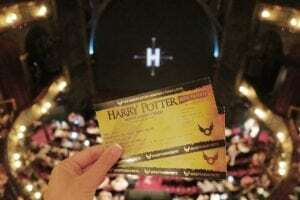 While I like Harry Potter and read most of the books when I was younger, Aaron loves Harry Potter–he’s a huge fan and was enthralled with the possibility of seeing such a momentous play. 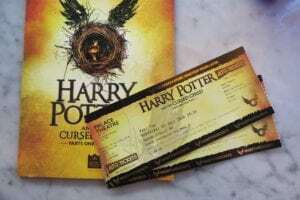 Harry Potter and the Cursed Child is an original new story by J.K. Rowling; it’s the eighth story in the series (released nineteen years later) and the first Harry Potter story to be presented on stage. It’s told in two parts, and so playgoers either see both in one day or come back on two consecutive days. While we considered joining the mad dash to purchase tickets online last year when they were released, we weren’t sure when or if we’d be in London–but before we could make a decision, tickets were gone! Every last show sold out in under an hour. Fast forward to now: A few tickets seem to be available on eBay and Stubhub, but they are upwards of £1000 a pop. Unbelievable! Since we’re in London, we figured there had to be an easier way, so we wandered over to the West End to see what was up at the Palace Theatre. I figured that even if we could acquire tickets somehow, they’d be outrageously priced–but fortunately, I was wrong! Before showtime, queue up outside the box office at Palace Theatre. (It’s on the left side if you’re standing outside and facing the front of the theatre; there is a special sign there to line up behind, but it’s very easy to miss.) People will come every day to return their previously purchased tickets to the box office, but the amount of tickets and their prices vary. The line outside the box office allows Harry Potter hopefuls to re-purchase the tickets that have just been returned. Expect to pay anywhere from £15-£60 (per part), depending on the quality of the seats. Even at the most expensive, that’s a small price to pay for such a hotly anticipated show! Weekdays are less crowded than weekends. We arrived a little before 1pm on a Wednesday and were the 5th and 6th people in line for the 2pm show! The box office staff told us that the length of the line is different from day to day, but weekends are busiest and the days closer to weekends (Thursdays and Fridays) are busier as well. One man told us he’s heard of people queuing as early as 5am on a Saturday! So depending on which day you go and how many chances you have to try to get in, arrive to the theatre with plenty of time to spare. Some days many people will get in, and other days only a few, so be as close to the front of the line as possible. We heard that the line can grow to wrap around the block, but on the Wednesday we went, the line only grew to about 10 or 15 people total (from what we saw). It’s possible that they all got in, or that we were the last ones who scored tickets. If you’re desperate to get in and only have one chance to try, get there early! See below for the performance schedule. Decide how important it is to sit together. Sometimes two tickets will be available, but in separate parts of the theatre. When we went, the four people ahead of us were a group; two of them went in separately and two of them got to sit together. When we made it to the front of the line, we were offered separate seats and decided to turn them down and risk waiting for seats together because we knew if we didn’t get in, we could come back to try again another day. (We’re in London for several weeks.) Fortunately, two seats together became available just 10 minutes before showtime and we were in! You might get a free ticket. A woman walked up to the queue and had a single ticket available–and she offered it to the guy behind us for free! He was so shocked, he couldn’t speak. She simply smiled and said “It was only a tenner” and walked away. Though the seat was indeed a £10 balcony seat, you can’t beat getting in to a sold-out show for free. Amazing things can happen when you wait outside the Palace Theatre. Have cash with you. Some tickets are cash-only, and some can be paid with a card (it depends on how the original buyer purchased the tickets). Though it’s better to have cash on you because it makes the process quicker, rest assured that there’s an ATM across the street if needed. You could get more than you pay for. We paid £40 per person, per part–£160 total. Our seats were on the Grand Circle level but had an obstructed view, as they were on the furthest edge of house right. While it was bearable, we noticed two empty seats smack-dab in the middle of the Grand Circle level and figured it was worth a shot… Each part has an intermission halfway through, and so during the first intermission, we kindly asked the people seated next to the empty seats if they would mind if we took those seats. They were fine with it, and so we had front-and-center seats for the remainder of the show! I’m not sure if this is allowed, but we did it and it was awesome. Don’t rely on the Friday Forty. 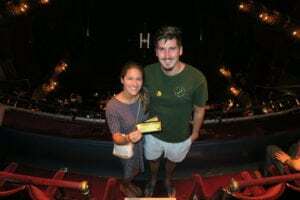 Every Friday at 1pm, HarryPotterthePlay.com holds a lottery with 40 tickets available for every performance the following week, and they are offering some of the best seats in the theatre at a crazy low price. You can try your hand at this, but know that 100,000 other people are trying, too. One last tip: There’s a gift shop with exclusive merchandise inside the theatre–which you can only access if/when you’re seeing the play–so bring a little extra to spend if you want souvenirs! There are branded t-shirts, tote bags, ties, pens, keychains, magnets, postcards, etc. They also sell the program (pictured above) for £5; it’s nicely assembled and informative, so we were glad we purchased it. 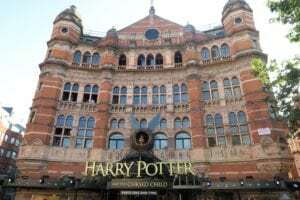 Have you seen Harry Potter and the Cursed Child? Are you hoping to? Questions, comments, and stories of similar experiences are welcomed in the comments below!